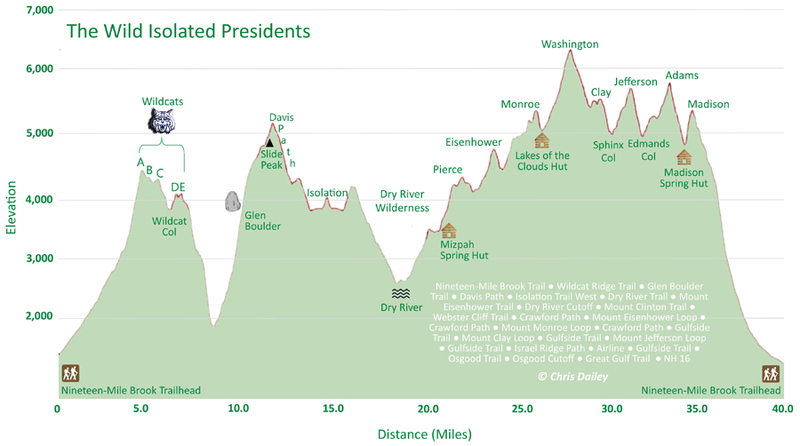 - Saturday, July 7 was my 39th birthday, so I came up with a route that would tally 39 miles of trails. With a near perfect weather forecast I decided to do a Wildcat Range - Isolation - Presidential Range Traverse loop. 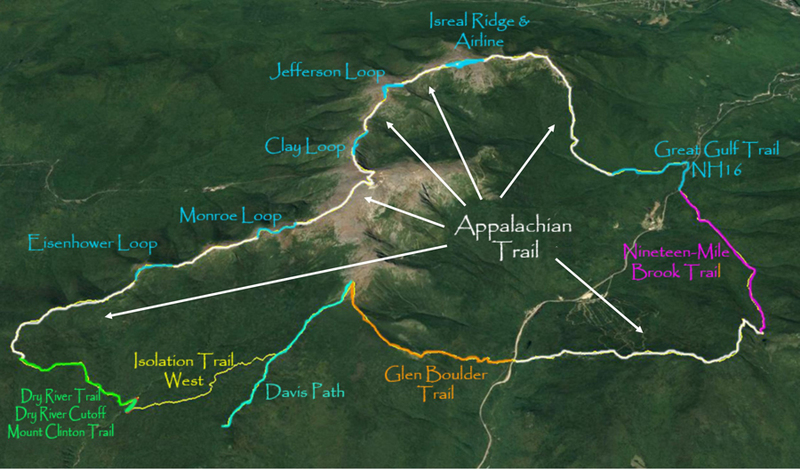 - The Glen Boulder Trail rises steeply in the woods before breaking out above treeline to Glen Boulder, which sits auspiciously high above the notch. It's a big tourist hiker attraction, and on this day it was no different, as I passed about a dozen people on my way up, one of which was a naked dude, apparently it was "Naked Recreation Week." My friend Todd, who was on Isolation a few hours after me, saw two naked guys on the summit, lucky him! - Anyway, I plodded my way up above treeline and the temperature was starting to warm up making the wind feel very refreshing as I passed by Slide Peak before topping out at the Davis Path trail junction. - I then dropped down the Davis Path, it's a beautiful trail above treeline, below treeline is another story as it's kind of beat up and muddy with some of the worst rotted bog bridges around. A few of these bog bridges act as seesaws which can be semi-dangerous when it spikes up and bashes your knee, hikers beware! - I reached Isolation's summit just before 10AM, having the summit all to myself. From the summit I backtracked 1.2 miles where I dropped down into the Dry River Wilderness via the Isolation Trail (West). It's a lightly used and beautiful trail, lots of dirt and pine needles making for soft and forgiving conditions. The last half mile the trail travels next to a brook which has been ravaged by the storms of 2011 and 2017. Trees have been uprooted and flung into the brook, there are also a few washouts along the banks of the brook which can make navigation a little tough if you are not familar with the trail, especially the last hundred feet of the trail which is basically washed away and travels over a dry spot in the brook bed before reaching the Dry River Trail. - The Dry River Trail has sustained quite a bit of new damage from last October's storm, luckily I was only on it for 0.3 miles and those few tenths of a mile had no new damage. After my short stint on the Dry River Trail it was time to climb back out of the Dry River Valley and make my way to Mizpah Spring Hut by way of Mount Eisenhower, Dry River Cutoff, and Mount Clinton trails. - The hike up is very quiet and very secluded, these trails are a great way to get away from the crowds. I saw only two people during my hike down into and out of the Dry River Wilderness. - As I made my way closer to the hut I was amazed at all the destruction to the trees in the woods, hundred just toppled over. The trail work that had been done to clear a path through this mess was amazing to see, major kudos to all the trail work crews for cleaning this up in a timely manner, outstanding! - When I reached the hut, quiet time was over, from now until dropping down Osgood Ridge over a dozen miles away I'd be seeing hundreds of hikers heading in every which way you could imagine. I saw a few familiar faces along the way, Sue & Chris doing a Southern Presi Traverse with their friend Paul. For those of you who don't know Sue, she is one of the most accomplished and humble ultra-runners/hikers in the United States. Click here for her blog - RunSueRun. I also bumped into my friend Pam just below Lil' Monroe, she was leading a hike for the AMC with a group of hikers that she will be taking over to hike Mount Kilimanjaro in August, how cool is that! - Like I mentioned in my opening lines, the weather was pretty much perfect. It was still windy above treeline but temps were in the low to high 50's depending on the elevation. I hiked in a t-shirt and hat, only because my cap would have been blown off and didn't want to burn the top of my head as I forgot my sunblock. - As I made my way up the elevation ladder over Pierce-Eisenhower-Monroe-Washington I started to get pretty hungry for some "really food" AKA hot dog, so I made a quick stop at the Washington summit cafeteria and bought one, which I immediately dropped on the floor . . . yes I still ate it, to the horror of the tourists seated a few feet away from me as I "Joey Chestnuted" that dog! - Next up was a pleasant stroll through the northern Presidential Range, Clay-Jefferson-Adams-Madison. I find hiking the northern part of the range easier going in this direction as each summit cone is shorter and has much less of a steep of an ascent. I made good time along the range under beautiful sunshine mixed with high clouds. My only semi struggle came hiking up from Edmands Col towards Mount Adams, my balance felt a little off but after ramping up my refueling and hydration I was good to go by the time I hit the summit. - From Mount Adams I rock hopped down the Airline and Gulfside to Madison Spring Hut, I prepared my gear for the final sixish miles and scooted up the summit cone of Mount Madison arriving around 5PM. - On my descent down Osgood Ridge to the floor of the Great Gulf I took in the views across the notch of the Wildcat Range, hard to imagine I was there this morning, while the late day sun started casting long shadows over the Great Gulf, an impressive sight to see. - There wasn't too much hiker activity for the final descent, only a handful of hikers and almost all A.T. thru-hikers heading to Osgood Tenstsite for the night. - Once I made it to the trailhead it was time for the most dangerous part of the hike, the road walk back to 19MB trailhead! I made quick work of the half mile along NH16 making it back to my car 13 hours and 9 minutes after I started and in pretty decent shape albeit sweaty and sore. A rare three wooden plank bog bridge sighting! Hiking down Osgood Ridge with the Wildcat Range in view, that's where I started from! Summit markers and pins. Wildcat A Peak not pictured, forgot to look!